Large giants standing 18 to 25 feet tall litter the highways of America, several scattered throughout California. In the 1960s and 1970s a fiberglass company called International Fiberglass created these roadside giants. 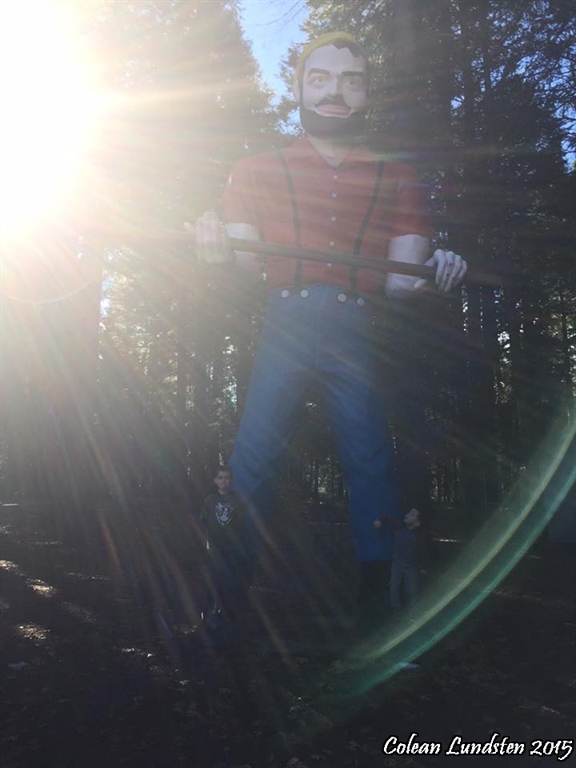 In 1962, a man called Bob Prewitt who at the time owned Prewitt Fiberglass created the very first Muffler Man, a Paul Bunyan style giant for PB Cafe on Route 66 in Flagstaff, Arizona. In 1963, Steve Dashew purchased the business from him and until 1975, Muffler Men were churned out by the company, now called International Fiberglass, and appeared on roadways throughout the United States. 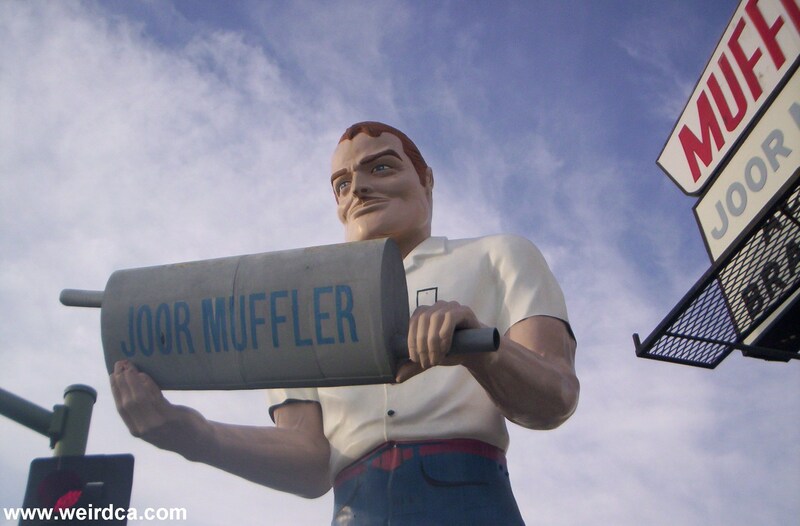 The term Muffler Man was coined by Roadside America probably sometime around the mid to late nineties, long after the last Muffler Man was built. Muffler Men are made entirely of fiberglass, hollow, usually portraying a rugged individual with broad shoulders and his left palm face down while the right palm is face up in order to hold an ax, golf club, muffler, tire, etc. They came in a few different variations. All of the below can be found in California with the exception of the Happy Half Wit, which will soon be present here as well. 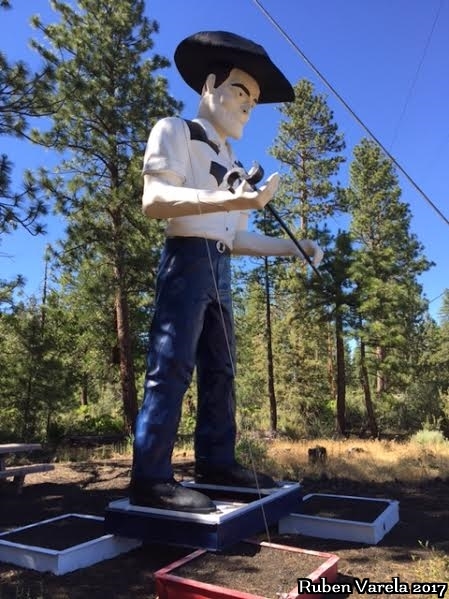 Classic or Cowboy Type - The classic Muffler Man came with the well known square jaw and was usually beardless although some have had mustaches or beards painted on. This model had a sub type and occasionally came as a cowboy with removable cowboy hat. The Paul Bunyan - Next, or perhaps first, was the Paul Bunyan model complete with ax, cap, and beard. The Indian - Giant Indians were also made by the company consisting of a different chest, arms, and heads. The arm instead of bent at the elbows and holding a variety of items had the right hand raised in the stereotypical Native American greeting. The chest was also shirtless and produced from a slightly different mold. The Happy Half Wit - Finally there was the country bumpkin style of Muffler Man known as the Happy Half Wit, which had the head replaced with a large eared gap toothed straw hat wearing noggin. Until 2014 there were no Happy Half Wits in California, but one recently arrived at the ever growing collection of Muffler Men located in Hayward. Uni Royal Girls - The Uni Royal girl is the female equivalent of the Muffler Man. International Fiberglass also made Giant Chickens! Sinclair Dinosaurs - Sinclair dinosaurs additionally were built and sold by International Fiberglass. Although pretty common in other states, especially Colorado, there are at least four Sinclair Dinosaur that I know of in California. The first is located in San Francisco at 1553 Haight Street inside a Shoe Biz store. The second arrived in 2013 and is setup in Lodi at an actual gas station serving up Sinclair gas. The third is also at a Sinclair Station, this time in Chico, having opened in 2014. Lastly, I know of one located in San Pedro, also at a Sinclair station, which I believe opened up in 2015. So it looks like we can expect to maybe see more Sinclair Dinosaurs on the roads of California in the years to come! Giant Roosters - at least twenty giant roosters live in California. They are 8 feet tall and weigh about 100 pounds. Several of these giant chickens reside ontop of chicken restaurants in Los Angeles. Originally Muffler Men were mostly found outside auto shops, restaurants, and later miniature golf courses, but now can be found almost anywhere. Muffler Men in the sixties and seventies cost anywhere from $1000 to $2800 each, depending on quantity ordered and accessories installed on each fiberglass statues. Now a days it is not surprising to see them go for $20,000! Probably, one of the more famous Muffler Men can be seen in the opening credits of the HBO series "The Sopranos". This is an actual Muffler Man from NJ. There are currently rumored to be 25 unique Muffler Men (including Uniroyal Girls) in California spread amongst 20 different sites. 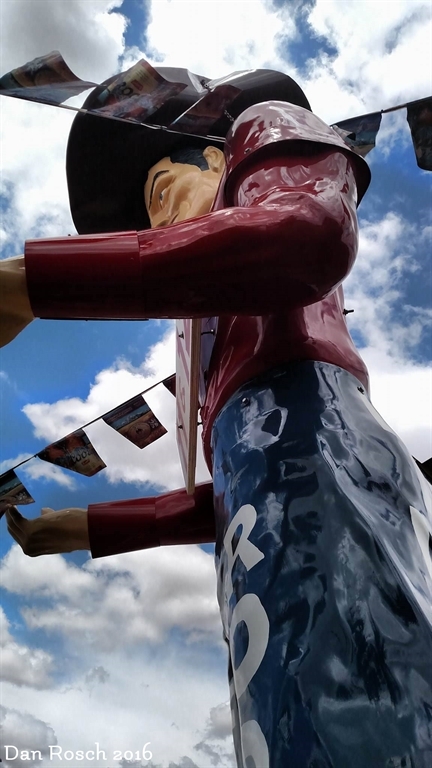 One location in Hayward currently has six different Muffler Men including a cowboy, a Happy Half Wit, a Uniroyal Girl, a smaller Bunyan Muffler Man, and two full sized Paul Bunyans! We have gathered pictures of at least 20 of those 25 Muffler Men! The only Indian style Muffler Man in California is in Bakersfield. Originally purchased by Ken Barnes in 1965 for the sum of about $1400, it was used to advertise Ken's tire shop, promoting Mohawk brand tires. There it resided in the middle of a roundabout, Garces Traffic Circle, before the tire shop was sold. Afterwards, it then was on display at a local school as the mascot for the Warriors. Eventually it ended up being taken down and stored in a back yard where it wasn't kept up and suffered from vandalism. Now the big Indian resides outside The Corral Café, far across town from its original location at Ken's tire shop. He now resides on Alfred Harrell Highway, a road named after Alfred Harrell, former owner of the Bakersfield Californian Newspaper. 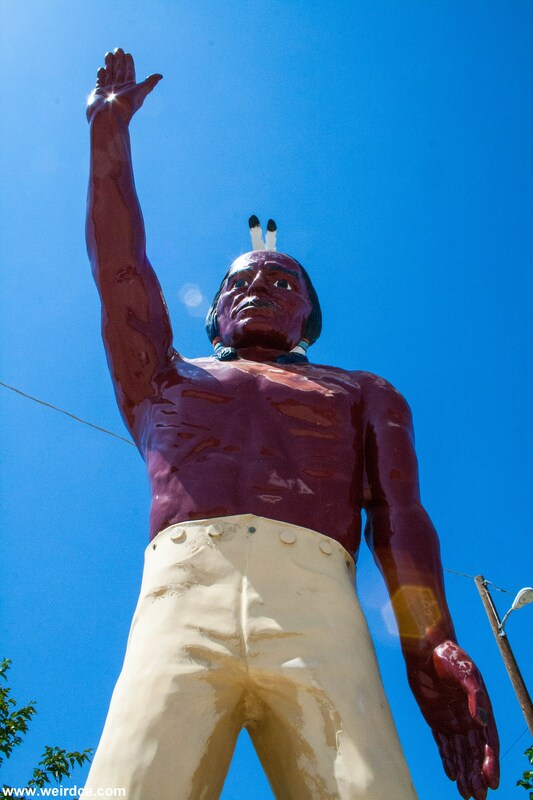 It is said that before he was put up at the Corral Café, he underwent somewhere around a $7000 to $8000 restoration to bring the Muffler Man back to the proud Indian he is today. 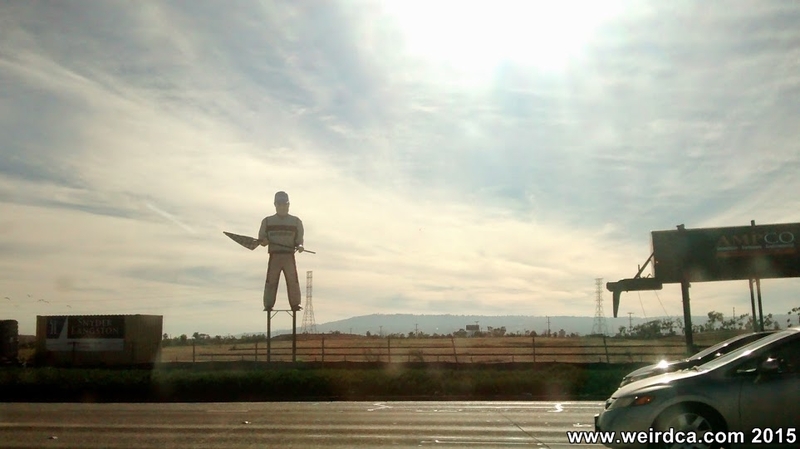 The Muffler Man in Carson was known as the Golf Guy and originally looked like a golfer, holding a giant golf club while he stood in view of the 405 Freeway near the 110 interchange. He use to stand on the edge of a golf course, but the golf course closed sometime around 2013. Golf Guy arrived at his present location in 1975. The location was purchased for the upcoming Porsche Experience Center and the Golf Guy has been transformed into the Porsche Man, complete with a new paint job, new outfit, and a black and white checkered flag instead of his original golf club. His race track driver's outfit is an actual outfit, complete with Velcro and zippers. The Compton Muffler Man is a classic style Muffler Man found on the corner of Myrrh and Crane. He is behind a fence and doesn't carry anything in his hands. He has been here since 2004. The Joor Muffler Man lives in Escondido and he has been standing outside the business, The Joor Muffler Service since the 1960s. Unlike a lot of other Muffler Men now a days, the Joor Muffler Man is actually holding a muffler, actually an original International Fiberglass muffler. He also has been known to dress up for both Christmas (in a Santa suit) and Halloween (in a large orange pumpkin). Rumor also has it that he owns a Hawaiian shirt for the hot summer days and that at one point, long ago, he use to wear a crown. 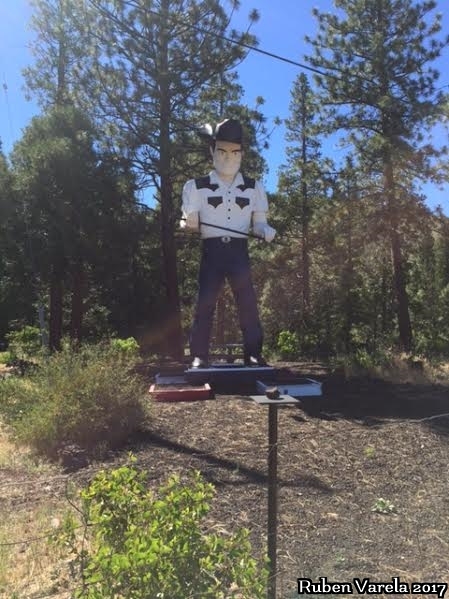 Located at River Bend Campground in Forestville, CA (east of Guerneville) is a Paul Bunyan style Muffler Man. At one time he carries what was either a spade or a canoe paddle, but since about 2015 he grasps the more traditional ax that Paul Bunyan Muffler Men often carry. And at one time he had a speaker attached to him that use to tell the story of Paul Bunyan. He may have originally been the Muffler Man in Healdsburg. 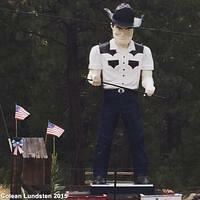 In Hat Creek along Highway 89 stands a Cowboy version of the Muffler Men. He stands on the premises of an actual working cattle ranch. He was formerly in Dunsmuir, CA where he stood as a mechanic, but in 2009 was relocated and transformed into the Cowboy he is today. 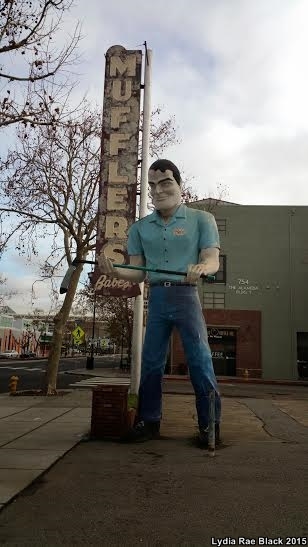 The highest concentration of Muffler Men in California is Bell Plastics where since 2011 Bruce Kennedy has been acquiring Muffler Men and giant fiberglass statues in general. Bruce's first purchase was a Hayward native known as Big Mike, a Paul Bunyan Muffler Man originally over on Mission Boulevard. He started his career outside Morris Car Wash, then later Tyre Treds, before being acquired by Bruce. Since then Bruce Kennedy has acquired the following Muffler Men: a Cowboy last from Missouri, another Paul Bunyan found in storage down in Paramount, and a Happy Half Wit last located in Flint, Michigan. The Happy Half Wit is known as "Hollywood" since he had a cameo in a 2008 movie. In addition to these Muffler Men, he has also purchased and erected in Bell Plastics's driveway an International Fiberglass Santa Claus, two Doggie Diner Heads, an unpainted Bob's Big Boy, a few dinosaurs, and a variety of other fiberglass sculptures. In June of 2015 he purchased a Uniroyal Girl from Illinois and she arrived by the end of that summer. She joined her fellow Muffler Men in Hayward, the only women amongst all the men. This will make her the second Uniroyal Girl in California, with the other down in Pearsonville. See the entry below on the Pearsonville Uniroyal Girl for more info. Another unique Muffler Man that can be found there is the Fireman Muffler Man. This is a custom Muffler Man recently created from special molds. He's a little shorter than the other Muffler Men, but no less impressive. Bell Plastics also makes Bobble Heads of Big Mike and Cowboy Don. Bruce Kennedy intends to make a line of six different Bobble Heads. Big Mike has resided in Hayward for decades. 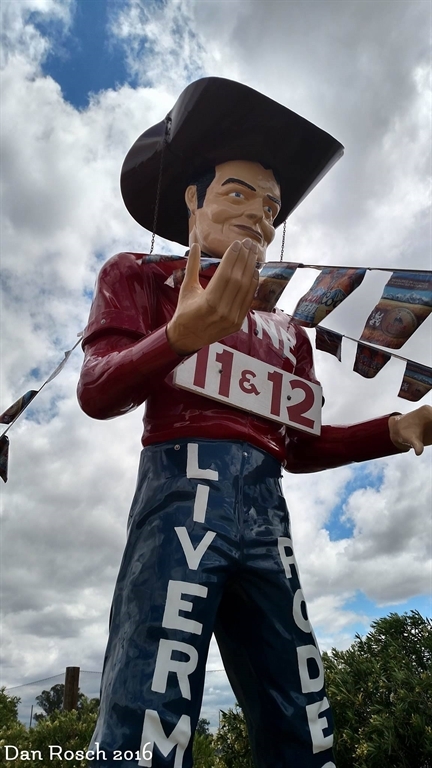 The Joshua Tree Cowboy Muffler Man is most recently from Mecca, California, but was sold in May 2017 and relocated to Joshua Tree in February 2018. Apparently he goes by Big Josh now and stands outside a renovated 1946 service station, now simply called The Station. When he was in Mecca he stood outside a mini mart called El Tompa Mini Mart, having arrived in the Salton Sea area back in the 1970s. He sadly lost his head in 2001, disappeared completely in 2007, but came back in 2014, only to finally be sold in May 2017. His new owners completely refurbished and painted him. He now has a yellow shirt on with a white hat. Before he had a white shirt with blue accents on the pockets, sleeves, and collar. Many Muffler Men have been customized over the years, morphing from the rugged large men that they were into other tall giants advertising new and different businesses. One such modified Muffler Man is Chicken Boy in the Los Angeles area. Chicken Boy has the head of a chicken and holds a large bucket. 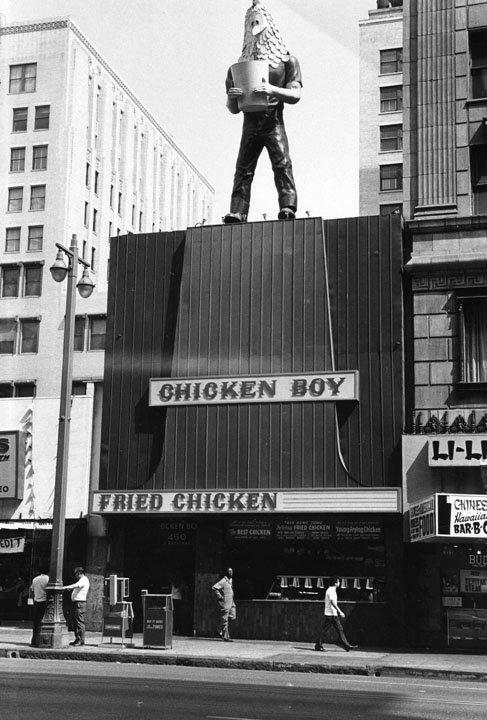 Chicken Boy originally stood over Los Angeles at 450 S. Broadway advertising for a chicken restaurant also called Chicken Boy (it's where the giant chicken headed statue gets its name). In 1984 the mutant Muffler Man was taken down shortly after the restaurant closed. It was saved by Amy Inouye who for over two decades held onto Chicken Boy trying to get him restored somewhere. Finally on October 28 2007, Inouye's efforts paid off and Chicken Boy was placed back up in Los Angeles over in Highland Park on North Figueroa. He stands on top of Future Studios. A few groups in the area refer to him as the "Statue of Liberty of Los Angeles". Additionally his birthday is supposedly September 1st. Besides Chickenboy, Los Angeles also has Tony of Tony's Transmissions. Tony is a classic style Muffler Man with a slightly darker complexion making him look Hispanic. He sports a bow tie, pencil thin mustache, and is holding up a car. Tony's Transmissions has owned him since at least the seventies, and Tony may have been in the area since the sixties. He was borrowed by Dennis Hopper, who made a mold of him and produced a Muffler Man off him. This copy can be found in Dodge City. Sergio in Los Angeles is a Paul Bunyan style Muffler Man wearing a checker board pattern shirt. He carries nothing in his hands and stands at the corner of Gallardo Street and Mission Road, before a business named Automobile Alley. The entire area nearby him is filled with automobile window tinting places. The Malibu Muffler Man is another example of a converted Muffler Man. Standing along the Pacific Coast Highway at a Mexican restaurant called La Salsa, he wears a sombrero, sports a mustache, and carries a large platter (formerly filled with food; food which was sadly stolen in 2006). The location was a burger joint back in the seventies. The Muffler Man, previously referred to as the Malibu Frosty Freeze Man, use to carry a large burger, one of the accessories a Muffler Man could be ordered with back in the sixties. The bottom half of the bun is now the platter and the top half of the burger is his hat. He is often called "El Salsero" or "La Salsa Man". The restaurant changed from a burger joint to La Salsa in 1987. Sadly La Salsa is now closed, but luckily the El Salsero still stands outside the empty building. The conversion of the Muffler Man from burger holding soda jerk to La Salsa Man was performed by artist Bob "Daddy O" Wade in 1988. In addition to the aforementioned use of the burger, the Muffler Man's shoes were turned into sandals using tires, and a serape was purchased for the big guy. Bob Wade is also responsible for several large roadside attractions in Texas as well as a Frog Mariachi Band in Tennessee. His Texas art installations include: a giant six shooter (somehow appropriate for Texas), a seventy foot tall saxophone in Houston, and the World's Largest Cowboy Boots in San Antonio. To see pictures of the Muffler Man before and after go to Experiencing LA. Both the Muffler Man in Malibu and Tony in Los Angles were used by Dennis Hopper to make molds. Two statues were created and after being temporarily on display in a tour, as of 2013 they were relocated to Dodge City, Kansas, Hopper's hometown. The statue created off of the mold of the Malibu Muffler Man is on display in Kansas as of 2016. Mentone just isn't home to a Muffler Man, but also a giant rooster and the head of the Statue of Liberty! Located all on the same property along with various signs, bottles, and other "decorations", the area proclaims itself the Mentone Beach or the Republic of Mentone. There are even several motors for boats hanging on the fence in front of the Muffler Man. The Muffler Man here is a Paul Bunyan style Muffler Man. When he was acquired by the current owner in 1983, he was missing his right arm, forcing his owner to create it out of a mold from his left arm. 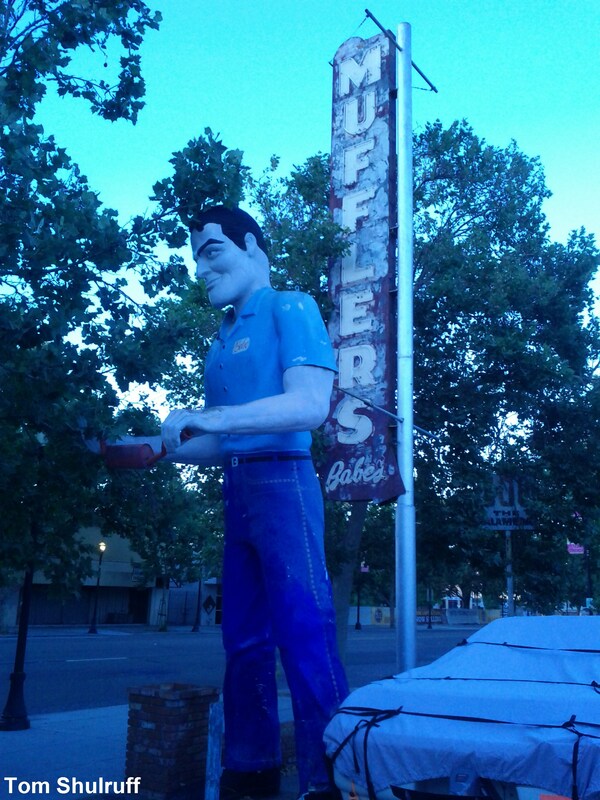 The Merced Muffler Man is a classic Muffler Man who isn't holding anything. At one time he held a mallet, when he advertised for a pest control business. At that time, he also had a pet rat sitting at his feet. He now stands near the Merced Ag Museum and Frontier Town. He's standing on top of some wooden boxes for a few extra feet of height. Although he has seen better days and his paint job is pretty faded, he still looks pretty good with his thin mustache. Scattered around the front yard of the Ag Museum are assorted cars, pieces of stuff, and other junk. The Ag Museum was closed the day we visited, but it is suppose to have a small frontier town inside. International Fiberglass also made several other types of fiberglass statues including the hard to find Uniroyal Girls. The Uniroyal Girl is the female equivalent of the Muffler Man and looks a lot like Jackie Kennedy. Her left arm is held up in the air and her right hand is on her hip. It is believed that at one point she might have carried something like a tire or an oil can. She was originally built in the 1960s for Uniroyal Tire in order to advertise their stores. By 1970 she was available in the International Fiberglass catalog for $3,150 as "Miss America". This price had her arriving in simply a bikini, with the option for clothes costing more. The clothes option included a dress. Uniroyal Girls were 18 feet tall and weigh 230 pounds. There is currently two Uniroyal Girls in California, with the second located in Hayward at the gigantic collection found at Bell Plastics. For the longest time there was only one in California and, despite the town she lives in becoming a ghost town, she can still be found in Pearsonville along highway 395 and is known as the Hubcab Lady named after a former resident, Lucy Pearson, who once collected over 80,000 hubcaps. The town of Pearsonville and the 80,000 hubcabs are now all long gone, but The Hubcab Lady still stands watch over Highway 395, although faded and sun weathered. A second Uniroyal girl was purchased by Bruce Kennedy of Hayward's Bell Plastics from Mount Vernon, Illinois in June of 2015. Like the one in Pearsonville, she also wears a dress. San Diego, once had a Uniroyal Girl and she apparently had multiple outfits that she could wear over the course of the year. She is long gone, however. Known as Babe the Muffler Man, he stands over on Alameda holding an actual muffler, not a giant muffler like so many other Muffler Men. He also sports a "Babe" name patch on his shirt and has, according to rumor, been in town since the sixties. Supposedly, at one time there were as many as three "Babes" (aka Muffler Men advertising Babe businesses) in San Jose, and sadly he'd the only one remaining. He sometimes, during hockey season, holds a hockey stick in order to support the San Jose Sharks. 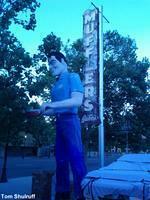 The Sutter Creek Muffler Man stands in a parking lot where Ridge Road meets Highway 88. He has a hard hat and isn't carrying anything. 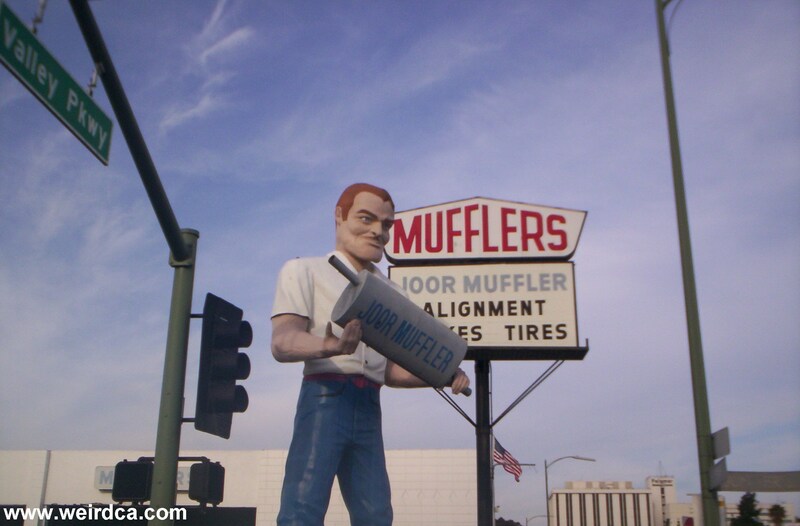 Kevin, the Van Nuys Muffler Man, is a Bunyan style muffler man and stands outside Tune-Up Masters. He holds nothing in his hands now, but is believed to have once held a tire, back when the building he stands outside of was a tire shop. He has been there for at least twenty years. His name is reportedly Kevin, and although he once sported a full beard, but he had his beard painted the color of his skin, so he now just wears a mustache. In Viola (Google Maps calls it Shingletown) there is, fittingly, a Paul Bunyan Muffler Man. 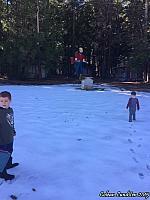 Located at Lassen Pines Christian Camp off of Highway 44, the Muffler Man is somewhere within sight of one of the ponds in the camp. He was originally located at the Paul Bunyan Restaurant formerly on Market Street in Redding, but this stretch of businesses all suffered economically when Interstate 5 was built and the restaurant closed. 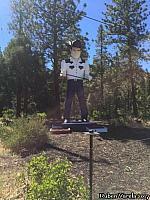 In 1971 the statue was donated to Lassen Pines. Special thanks to Colean Lundsten for the pictures! The Willits Muffler Man is a Cowboy version who stands at the Willits Rodeo Grounds. He is known as "Cowboy Willie" and carries a branding iron with a "W" on the end. He also sports a belt buckle depicting the race horse Seabiscuit, who retired to Ridgewood Ranch near Willits. El Monte - El Monte used to play host to a classic Muffler Man complete with a hard hat and a golf club in his hands. He went by the name of Edwin and was located within the fenced in area of the business to which he belonged. But sadly for California, the business he stood outside of closed and he was sold and subsequently moved to Gallatin, Tennessee. Glendale - there may be an Indian Muffler Man stashed away on a private residence down in Glendale. A picture I've seen of him has him sporting a hat and even a guitar. Healdsburg - formerly located at the Giant Muffler Service on Healdsburg Avenue. On April 26, 1964 he rode a motor boat in a yacht parade in San Francisco Bay. 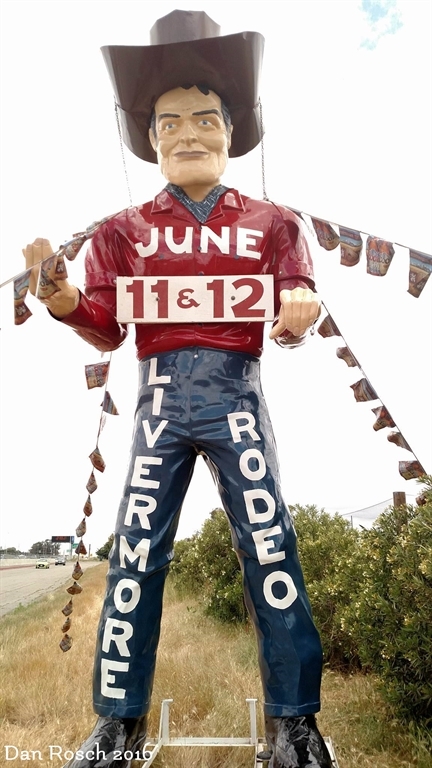 Livermore - a Cowboy style Muffler Man makes appearances often in June somewhere around Livermore, in order to promote the rodeo that takes place there. Mountain View - a Uniroyal Girl stood inside a bar until the bar sadly burnt down in 1998 with the Uniroyal Girl inside it. San Diego - formerly located near Interstate 8 and Mission Gorge was a Uniroyal Girl! She stood over a bar and had several different outfits that she would wear including a Batgirl outfit! Sacramento - a Uniroyal Girl may once have stood in Sacramento. San Francisco - Formerly at a gas station located at 17th Street and South Van Ness Avenue, this Muffler Man was a Paul Bunyan. He stood on the intersection back in the 1970s and I have heard he was dressed to support the San Francisco Giants, a Major League Baseball team. Van Nuyes - Van Nuyes use to have an Indian Muffler Man as well. It was located on Victory Boulevard, west of 405. Supposedly once a Mohawk Gasoline Station it is now currently an Arco. 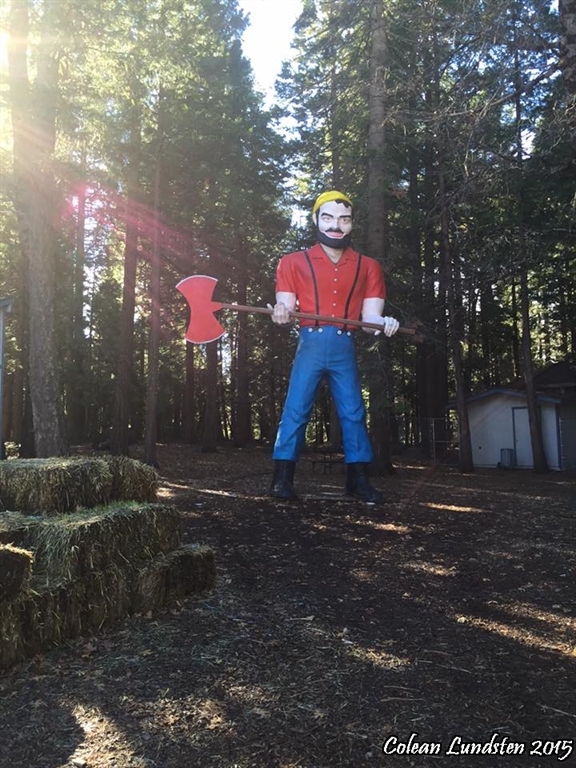 Ventura - there may be a Paul Bunyan style Muffler Man holding an ax somewhere on private property down in Ventura. Vista - this Muffler Man was a Bunyan style Muffler Man, but had his right arm going straight up in the saluting style of one of the Indian Muffler Man. He was formerly located at 2244 S. Santa Fe Avenue, but sometime in 2007 was moved to Rocky Point, North Carolina. Whittier - Classic style of Muffler Man, outfitted with a crown and a muffler. He was at 15130 E Whittier, but now resides in Unger, West Virginia. So far, we've found nineteen of the many Muffler Men out there, and we'd love to have your help finding other Muffler Men. Although we obviously only concentrate on California, we'll also be very appreciative for anyone sending us pictures of Muffler Men out of this state as well. Additionally, many of the Muffler Men out there have moved or changed over the years. Older pictures of them that we could post here, would also be very appreciated! Happy hunting! Anyone remember the muffler man who actually held a golf club in Norwalk mini-golf on Pioneer Blvd at Imperial Hwy? Am I hallucinating? Am I not remembering clearly. Family moved away in 1969 when I was 8 years old. Maybe I not remembering correctly, but I distinctly remember it. There are at least 2 Sinclair dinosaurs in Fresno. There's a local group that makes clothes for one of them, but they dress him covertly... no one knows when his next outfit will show up. Pretty sure that in the 60's and early 70's, before he was the "golf guy" the Carson muffler man held a tire. "Babe" in San Jose holds a hockey stick sometimes during the San Jose Sharks hockey season. The last time I saw the Carson "muffler man" next to the old location of the golf course, he no longer had his golf club. Does anyone know if he's still there? The Indian "Muffler Man" in Bakersfield was brought to town by me in 1965 and placed in front of my tire store to help advertise Mohawk brand tires I sold at that time. 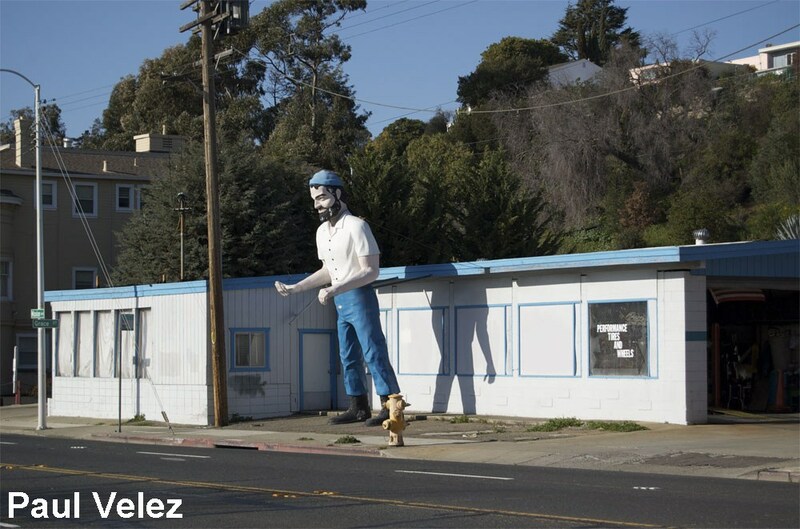 The Hayward Paul Bunyan, affectionately known as Big Mike, as he once stood at Mike's Carwash, has been fully restored and moved to 2020 National Ave in Hayward. Having grown up in Escondido I always remember seeing the Joor Muffler man. It was a landmark in our town, everyone knew it. During the Christmas season the owners even dress him up in a giant Santa suit with hat and white beard. But I remember while driving through Pasadena one day it was the first time I say another. I saw a Mexican Muffler man holding a buirrito. Growing up, there was a large Peter Pan on top of a market by the same name on the corner of Normandie and Pico in Los Angeles. 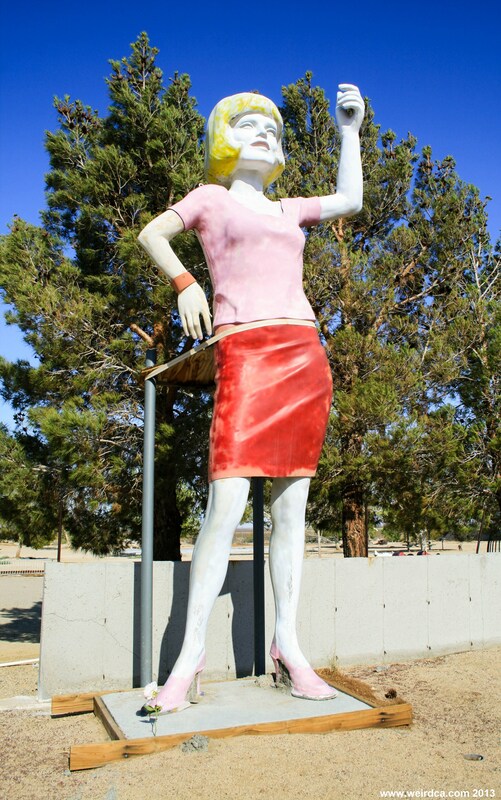 I believe one of the Uniroyal female statues is located in Pearson CA on the 395. There's one you can see for 3 weeks before the Livermore Rodeo. He's a Cowboy. Is visible on Hiway 580 at the Los Positas Golf Course. Tony the Muffler Man at 4327 Cesar Chavez, in East Los Angeles, is no longer there. Tony's Transmission Service has closed its doors sometime in August 2010. The property is now up for lease. We have our own muffler men group on the corner of Van Buren Blvd and Dauchy! 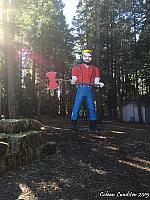 There's a giant Paul Bunyan at Trees of Mystery in Klamath, CA--and it talks to you when you walk by! can anyone remember a giant paul bunyon at foster park in ventura?